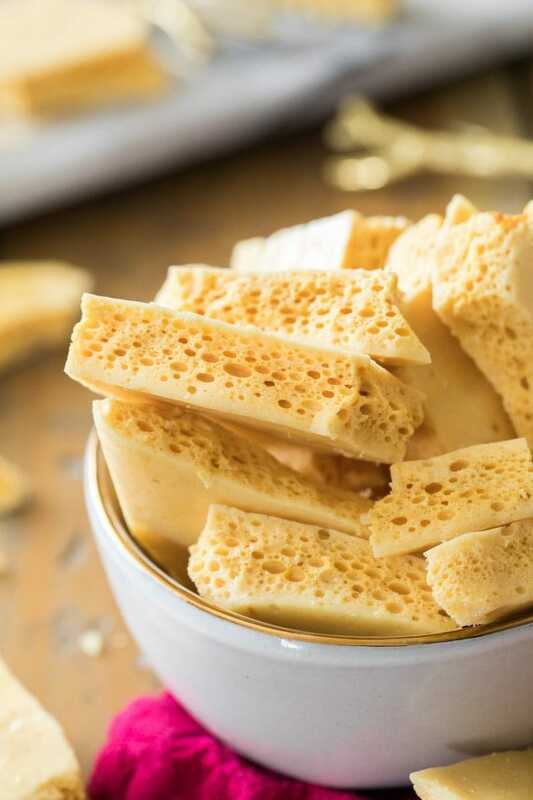 Honeycomb candy, sponge toffee, cinder toffee, hokey pokey… Whatever you call it*, this recipe yields a sweet crunchy candy with hallmark honeycomb-esque bubbles. Today I’ll be walking you through all of my tips for making this Honeycomb recipe in your own kitchen. I’ve also included a brief how-to video! This is the second candy recipe in my series this week. Yesterday I shared my toffee recipe… stay tuned for more! Welcome to candy recipe #2 for this week: Honeycomb candy! Just 4 ingredients (sugar, corn syrup, water, and baking soda) are all that are needed to make this classic favorite. 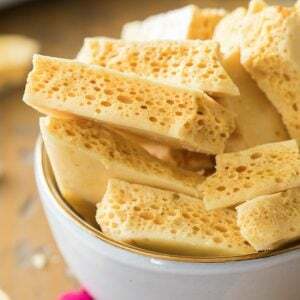 With its sweet golden exterior and those telltale honeycomb-styled bubbles, this recipe is popular all over the world under many different names. My personal favorite way to enjoy this honeycomb recipe is to prepare it, break it into pieces, and then dip or drizzle with chocolate. Let’s go through some important tips, and then let me know your favorite way to enjoy! If you’re following along with every recipe this week, I’m going to sound like a broken record with some of these tips. While they may be repetitive, they can make all the difference when you’re making your candy, so they’re worth reading over again (and again)! Have everything ready before you begin. You’ll be cooking your honeycomb mixture to 300°, but once it reaches that temperature you need to move fast or your candy will burn as the temperature continues to climb. Have your baking soda nearby and have your pan already prepared, that way once your thermometer reads 300F you are ready to roll. The temptation to keep stirring your syrup once it starts boiling is real, but it’s completely unnecessary with this honeycomb recipe. So long as you’re keeping your stovetop temperature at medium heat, it won’t burn. However, don’t walk away from your candy! It takes time (more on that in a minute) but as soon as you turn your head for just a single minute to send one single simple text message (with the perfect gifs and all) to your sister, it will rocket up past 300°F and your candy will burn and you’ll have a mess and will have to start all over… ask me how I know. The syrup will boil for a while. How long exactly will vary depending on your stovetop heat and the pan you use, but it does take time and a little patience. Don’t be tempted to turn up your heat past the medium temperature indicated in the recipe, or you’re more likely to scorch and ruin your honeycomb. Can You Make Honeycomb with Baking Powder? Unfortunately, no. 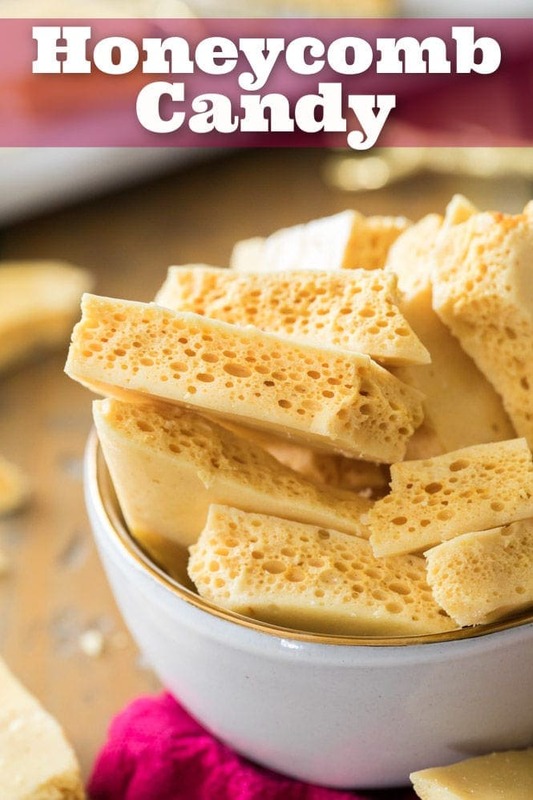 You will need baking soda to make this honeycomb recipe and to get those signature bubbles. How Long Can You Store Honeycomb Candy? Honeycomb can be stored at room temperature in an airtight container for up to one week. It tends to absorb moisture in the air and become sticky so it will not last as long in a more humid environment. Do not refrigerate your honeycomb. Treat yourself to a FREE E-BOOK! 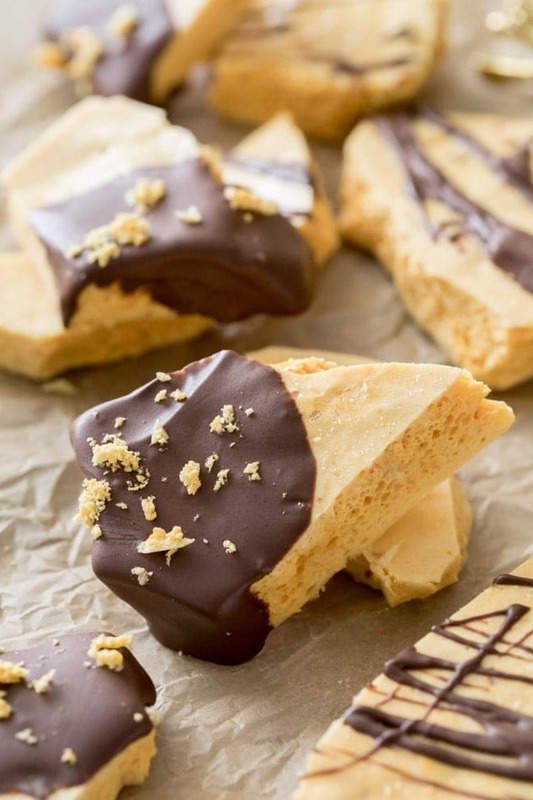 A great and easy recipe for Honeycomb Candy! Be sure to read through the whole recipe, measure out all of your ingredients, and prepare your pan before beginning. Be sure to check out the recipe VIDEO below the instructions! Line an 8x8 square pan with parchment paper and set aside. 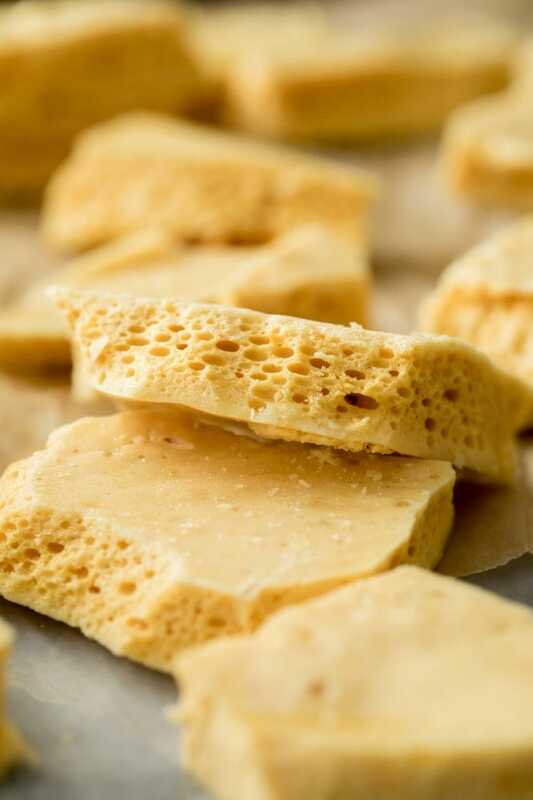 Before you begin, be sure to measure out your baking soda and set it aside, you will need to have it ready once your honeycomb candy comes to the correct temperature. Combine sugar, corn syrup, and water in a medium-sized heavy-bottomed saucepan over medium heat. Stir frequently until the sugar is dissolved and mixture comes to a boil (this will take some time, don't turn up the heat above medium to speed up the process or you could ruin your candy). Once mixture begins to boil, attach your candy thermometer (make sure the tip of the thermometer is not touching the bottom of the pan) and don’t stir any longer. Without stirring, cook to 300°F (149°C). Once mixture reaches temperature (it will still be clear at this point, it is supposed to be), immediately remove from heat and stir in your baking soda (heads-up! It's going to bubble up quite a bit). The mixture will immediately begin to foam, stir until baking soda is completely combined and the color turns golden, but don't over-stir or you'll end up deflating your candy and won't have any holes. 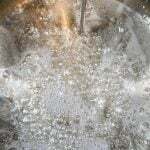 Once foaming stops and baking soda is dissolved into the mixture, spread into prepared pan. Cool at least 1 hour before breaking into pieces (you may be able to use your hands, or whack it with a knife or use a mallet to tap a knife into the honeycomb to break). If desired, dip or drizzle cooled broken honeycomb pieces with melted chocolate. Store uneaten honeycomb in an airtight container at room temperature for up to one week. Let your pan cool (you don't want to warp it by putting cool water in a scorching hot pot) and then fill it over halfway with water. Return it to the stovetop and bring to a boil and the candy should melt away from the sides (use a heatproof spatula to help scrape the sides while it's warm). Pour out the water/candy mixture and allow it to cool before cleaning properly. This post contains affiliate links, which means that if you purchase anything through these links I will get a small commission at no extra cost to you. Please view the disclosure policy for more information. *I’ve also heard some people call this candy “Seafoam”, but for me seafoam candy has always been synonymous with Divinity. Hi! I just made this and although it taste great, it is very thin. I used an 8×8 pan…but I didn’t have parchment paper so I used foil, would that make it go too flat? I have been searching for years for this recipe! My Mother used to make this for her 5 girls..I’m the oldest. She called this candy Seafoam. Thank you so much for sharing this recipe! I’m on my third try of making this candy! I have my burner on 3 out of 10. First try burnt at the very last minute and second batch burnt early in the recipe, even before temperature reached 220. What in the world am I doing wrong? Thank you! Yours looks amazing and I can’t wait to try it! I didn’t even think about my candy thermometer! Just assumed it was working correctly! You were exactly right! It was several degrees off and is now in the trash will I enjoy a fresh new perfect batch of your honeycomb candy!!! Thank you so much. Do you think honey, maple syrup or molasses can be substituted for the corn syrup? They would give some nice flavors… Thank you for sharing! Hi Susan! They may, I haven’t tried it so I honestly can’t say for sure. My biggest concern would be that the honey, syrup, or molasses would burn quicker than the corn syrup would. If you try it out, would you please let me know how it turns out for you? Thank you for sharing. I have been wanting to find a honeycomb recipe. I saw Nigella Lawson make it once but she did not include a recipe. Hi! Can you use an 8×8 silicone pan to avoid having to line the pan with parchment paper? I do this when I make caramels and it works beautifully. I have a question not a comment. I’m wondering if this is a soft sponge type candy or a hard sponge similar to a brittle but not quite as hard. In western ny we are known for sponge candy covered in chocolate. It is a soft sponge so you won’t lose a filling lol. Thank you!!! Btw your tid bits of tips are great. I love your videos. It’s a nice way to see how a recipe should appear. In fact I had a flop, I reviewed your video to see what I did wrong on a previous recipe. Thx!!! Hi Michelle! This is a hard sponge more similar to brittle. I’m not familiar with the softer version you mentioned, is it also called Honeycomb? I’d definitely be interested in trying that recipe out, too!